This exercise and its consequences are traditionally known as "blessing" and "cursing." Always conclude this exercise on the "blessing" note. For a group demonstration, send a volunteer out of the room while you explain the test to the group. Test as follows. Uke test the volunteer for Unbendable Arm. On unspoken signal, group extends ill will towards the volunteer, hope of failure, thinking of everything disliked (real or imagined) about this person. Uke test for Unbendable Arm. On unspoken signal, group extend kindness, caring, and good will towards the volunteer. Uke test again for Unbendable Arm. The volunteer nage may be tested while facing away from the class in order to eliminate visual clues, or facing the class to include visual clues. Do individual demonstrations in groups of four. 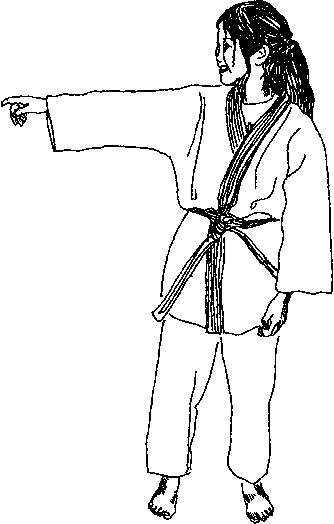 An uke and a nage repeat the steps above, uke providing the flow of ill or good will towards nage. The two other partners test the active uke and nage. What is the effect of good or ill will on the person who receives it? On the person who sends it? Stop — Get quiet and let other concerns go. Observe — Focus your attention on a person, pet, or other living thing1, either in person or as an image. Appreciate — Notice the good in that being, not as you wish it to be, but as it is now. Bless — Send a flow of good will towards the entity. Stop — Release or reduce your caring-connection. Uke test the blesser (and if possible, the blessed). The connection is what makes this exercise powerful, whether it is called "extending ki" or "ki healing" or "blessing and prayer." Most powerful: How can we help [this person]? Most ineffective: "Please bless all the poor and homeless, and all the starving children in far-away countries." 1. Some Interesting results came from playing with this exercise at a pond. 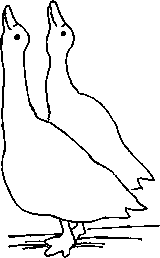 One group therefore refers to It as "Bless A Duck" but the possibilities are limitless.